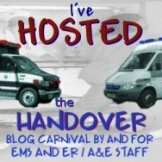 Well, thanks to a last ditch takeover, ‘The Handover’ EMS Blog carnival will now be kept going, and will hopefully move on to bigger and better things with TWO new administrators leading the way. My gratitude goes out to Rescue Monkey and From a Probies Eyes, who together, have taken on the role of the ‘go to’ people for all things Handover related. The carnival will take one month off whilst they have a play with the Handover`s base blog site and think about how they are going to move it forward, then we will be back with Issue 15 next month which will be hosted by Steve Whitehead from ‘The EMT Spot’. Details on his theme will be coming a little closer to the time, and I will of course continue shouting about it whenever possible!. I am also trying to update the mailing list which I used to use for the news about the Handover as there has been so many new blogs start in the last 6 months. If you want to be part of the Handover family, please send a quick email to the chaps at thehandover@googlemail.com so that they can update the list. PLEASE let every one know about the new email and the new administrators if you can. if you have a blog, we would really appreciate you posting just a little something so that everyone knows who to contact now. If you are on twitter, then tweet something little for us.